I wasn’t planning on attending the Apostle Island Inline Marathon, but when the opportunity presented itself, I jumped at the chance. My wife and I decided to make the trip to Ashland, Wisconsin, around mid-morning, and tried to set plans in motion to leave at the end of the work day the day before the race. I hurriedly prepared gear and registered for the race while my wife found a hotel for us to stay at on Friday night. The race was scheduled for the morning of June 14, 2014. For those that are not familiar with this race, it takes place on Madeline Island which is off the cost of Wisconsin in Lake Superior near Bayfield, Wisconsin. You get to the race by taking a ferry from Bayfield to the Island. Once on the Island, it is a short walk to the start/finish line and the event location. This area of the North woods of Wisconsin is beautiful, and we happened to be driving through a national forest on the shore of Lake Superior just in time to see the Honey Moon. It was a fun, though impromptu, road trip to be sure. We got to our hotel in Ashland, Wisconsin, late Friday night, and, after reviewing the schedules, determined we needed to be up early Saturday morning in order to make it from Ashland to Bayfield (a roughly 30 minute drive) and catch the ferry to the island. Packet pick up is typically held on Fridays at the Amory in Ashland, and it stays open pretty late. However, we didn’t arrive in Ashland soon enough, and opted for race-day packet pick up. It wasn’t hard, and everything was very organized. We got on the ferry and made it over to the Island with about 30 minutes prior to the start of the first race wave. I signed up for the recreation/fitness wave because most of the guys I usually race with in the Advanced divisions signed up for that wave. It was cold, probably high 40s for the temperature, and it felt like it was going to rain prior to the start of the race. By the time I was dressed and took about a mile or so skate to warm up, I was ready for the race. We lined up by division in our different waves, and the race organizers started the event promptly at 8:30 AM, with each consecutive wave leaving about 30 to 60 seconds behind each other. The rec/fit men lined up behind the pro women. The race is a three lap circuit around the island that is just short of 9 miles per lap. The weather was mostly dry, a little cool, and I was worried it would rain during the race after looking at the weather. We did get a little bit of rain, but only enough to wet the pavement. It wasn’t hard or steady, and it didn’t seem to change the course conditions. I chose to race on my 110mm World Record Wheel Truths that are 87a hardness. 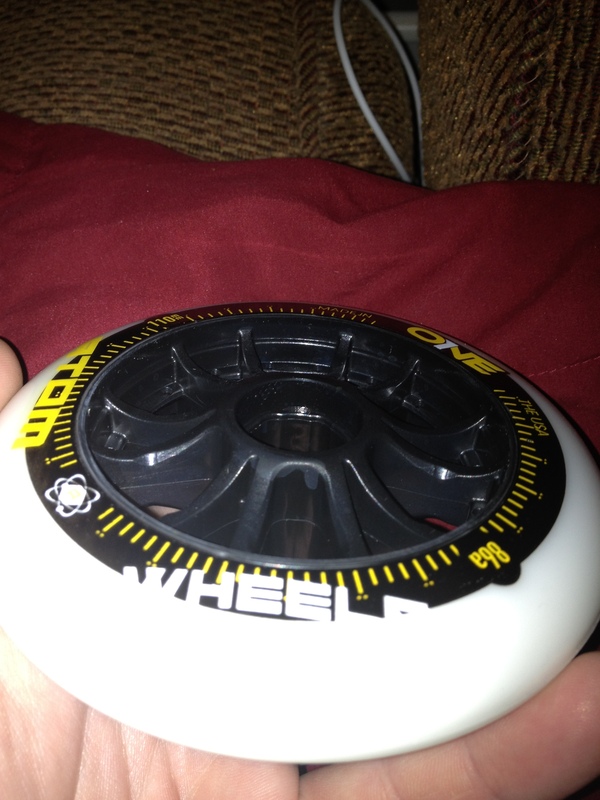 This is stiffer wheel, and I was hoping to get good roll. They rolled very well, with good grip, even in the wet conditions. It wasn’t wet enough to get a good feel for how they would work in a steady rain, but they stuck during the race, and that is all I cared about. We got the call for the start of our wave, and, as the gun went off, a group of about 1o of us came off the line and took the first tenth of a mile to figure out how the line would start. One or two guys got out front, and as the line formed going up the first hill after the first left hand turn, we caught up and formed up in the line. The pace started pretty quick and stayed there. We eventually caught up with the chase pack for the pro women’s group and, at some point, the advanced skaters from the 50+ group. There wasn’t anything really exciting that occurred during the race. There weren’t any real attacks, but the faster skaters did pick up the pace when they reached the front and pulled the pace line. The action didn’t heat up, really until the last lap. There was a lot of anticipation in the pace line on that lap. The pace didn’t start to pick up until about 4 miles in when people from the back of the line started to move up. Those of us in the front of the pace line kept pace, and the attacks built until we were 6 miles into the lap. At that point, the line broke up and everyone was skating for the finish, hoping to gap the group and lead a flyer to the finish line. We finished as a pretty solid group, all within about a minute of each other. It made for an interesting pack sprint in the last half mile. Unfortunately, my helmet camera died and I didn’t get video of the pack sprint. My wife did get finish line video, though. What makes the finish on this course hard is the 90 degree right hand final turn. It is narrow and sharp, and only leaves a couple hundred meters to the finish. Once we got through that corner, which everyone seemed to take wide when I cut right at the curb, it was a full sprint to the finish. My goal for this race was to hang on to the lead pack in my division. I didn’t train for this race, had only done one interval skate, and was coming off of a training week that included a heavy lift and a tempo skate. Even with 2 days off before the race, I didn’t feel 100%. Also, sleep the night before was a bit elusive thanks to a fitful toddler that couldn’t seem to get comfortable. So, with little or no preparation, I signed up for this race, and just hoped to finish, ideally with the lead pack in the wave. I couldn’t be happier with the result. I ended up pulling the line a couple of times and finishing with the pack in the pack sprint. I used a lot of what I learned at the Joey Mantia Clinic the week before, and the changes in technique helped to insure I had the energy to finish with the group. I plan on doing a lot more technique training, too, in hopes of increasing my average pace and have solid finishes in the rest of the races this year. My finish time was 1:25:08, a new personal best marathon by nearly 7 minutes. I also managed to win my division and finished in the top 10 or so of my wave. It was a great race. I came at this race only two weeks after the Chicagoland Inline Marathon with only five training sessions. I was hoping to get more miles in on skates, on my bike, or some dry land work, but life gets in the way. I had a lot of apprehension about the race because of the limited training and limited preparation time. Coming out of Chicagoland, I was disappointed by a time I was hoping would be better. I couldn’t figure out if I didn’t train enough, if there was a diet problem, or if I just wasn’t in the shape I was in last year. 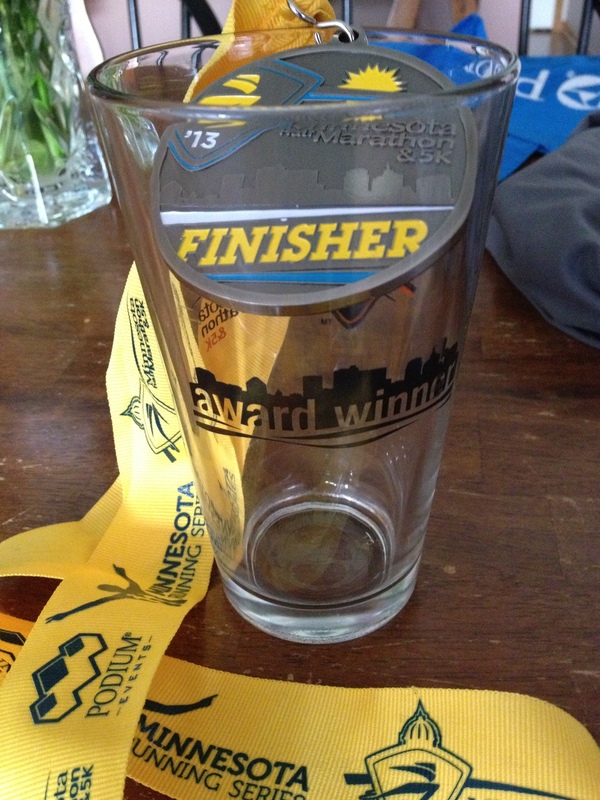 These feelings compounded a bit going into the Minnesota Half Marathon. This race tends to feel like the late season litmus test going into the last 6 weeks before the Northshore Inline Marathon in September. Last year, I finished the Minnesota Half far better than I could have expected, setting a new personal best for a half marathon distance at just over 43 minutes. I had one goal going into this race: to stay with the main pack. I didn’t want to get dropped from the pack at all if possible. Last year, they left me at mile 9. This year, my goal was to finish with the pack, but going in I would have been happy to last longer than 9 miles, and make it past the last turn-around point on the course. I was nervous at the start, and on the video you can see me rocking back and forth. We didn’t have any problem getting into St. Paul to stay with my sister-in-law this year. The weather was great, and the trip is now only an hour since we live in Rochester, Minnesota. This basically makes this race a local race for me. My wife and sister-in-law decided to run the 5k at the event this year, so I was out the door at 6:30 to head to the race for a 7:34 AM start time. I got there, found parking, paid for parking, and by the time I got to the location of gear drop-off, it was just after 7 AM. I got ready, dropped off my bag, but didn’t have time to warm up because they called the skaters to the line for the start. I was nervous because of my lack of training, my goals, and my result at the Chicagoland Marathon. One of the odd things about sport performance is the degree to which the mental component matters. I knew what I had to do, and once the countdown for the start of the race hit 0, it was all business. I skated the race on the same gear I skated the Chicagoland, and this race included the same wheels and bearings from last year’s race. Everything worked out very well, and even though there are now considerably more miles on my 2012 Bont Black Ops 87a 110mm wheels, they are wearing well, continue to roll well, and are very smooth over rougher surfaces for such a hard wheel. My new boots and frames did excellently as well in the conditions. My new boots (2012 Bont Zs) are starting to break in very well, and get more comfortable every time I skate them. The first part of the race was similar to last year. The front starters and fast skaters took off and set a fast pace. We were cruising at around 20 miles per hour headed to the first turn-around point. I stuck with some of my teammates, and the first trouble in the race really didn’t spring up until we caught the slower duathlon skaters. We had to maneuver through a small group of slower skaters, and the slower skaters basically covered the course from about a half mile in to the first turn-around point at around 2 miles into the race. Once through the turn-around, there weren’t any obstacles in front of the main pack. The dynamics of the pack were similar to last year, in that they were all over the place and the front of the line wasn’t calling hazards. There weren’t any major surges in the pace except for on the hills, which are mild and short by comparison to the hills on the Chicagoland course. The pack cruised along, swapping positions with skaters coming up on one side or the other of the line. We hit the big hills and I just hung on for dear life, working hard to close any gaps that opened in front of me. I kept checking my Garmin to see what my heart rate was doing. It is interesting to watch the video now to also see where I was with my heart rate. It wasn’t as elevated as last year, so I am in better physical condition, at least so it seems. As we got to mile 9, and were coming up to the last turn-around on the course, I got nervous again because I started to gap the line at the same point as last year. I could feel my heart pounding in my ears, and decided to push through and stick with the pack as long as I could. We made the turn around, and with one of my race goals down, I was going to ride it out and see how long it lasted. However, we turned the corner and the pace of the group slowed. Not remarkably, but enough for me to catch my breath and recover a bit. As we headed into the hilly section on the return, there was a skater in front of the one of my team mates that kept letting other skaters in the line. My team mate decided he didn’t want to let this go on, so he jumped out of the line. I didn’t want to get left behind, so I went with him. What was supposed to be a tactical move up in the line turned into a short flyer. Next thing I know, we are out in front with a gap on the line as we crest over the hill. My team mate moved into the draft behind me and we started down the hill. He warned me that the line would likely come flying by us on the down hill. At that point, I was too spent to care, and just coasted the hill. The pack caught up, but the surge didn’t happen until we were headed back up the next hill. Thankfully, the down hill coast was enough for me to recover from the sprint. As the line went by, I managed to stay with the front 15 or so skaters. The pace picked up from there. We crossed the 12.5 mile mark and the line disintegrated into an extended field sprint. The guys at the front of the line stayed together, but farther back, it was every man for himself. I really pushed the pace all the way to the finish, and my speed was considerably higher than what I usually skate. My heart rate was through the roof, but I made it to the finish. Officially, I finished with a time of 40:49.88, finishing first overall in the open masters division (age 30-39). Last year, I picked up a set of Atom One IQ X-Flex wheels from the Luigino Outlet. I try to shop the outlets as often as possible to save money. For most of us who are hobbyist sportsmen or sportswomen, we are always struggling to keep up with the curve of technology while still getting the most our out of our limited dollar. When I raced motocross, the penny pinch was much worse. We would calculate upgrades, and build our bikes to last as long as possible between repairs and upgrades. The same rules applied when we switched to go-carts. Now, chest deep in Inline Speed Skating, the same rules apply. With top boots in the $1,500 range, and top end wheels running $26 per wheel, a full set of world class custom skates can run close to $2,000. While inexpensive to get into the sport, compared to cycling where a set of wheels can cost as much as high end skates, the tough part about skates are the components that need to be regularly replaced, or have specific uses based on conditions. Wheels are a terrific example. Conditions have a direct effect on wheel choice. Harder wheels are better on smoother surfaces. Rain requires wheels that grip in wet conditions, which can be a rare characteristic of urethane wheels. Wheels, though, are rarely on sale, and when they are, they are usually much older models that have been succeeded by much better technology. I previously discussed the trouble I had with the Atom One IQ X-Flex wheels. The 8 that I purchased all had significant hub failure, where each of the hubs developed splits or cracks such that they were no longer safe to use. When I contacted Nistevo, the parent company that operates Atom Wheels, they were reticent to help resolve the problem because the purchase originally came from the outlet, which has an as-is warranty policy. After several email exchanges the manufacturer agreed to replace the defective wheels with the current generation wheels that were one step below the wheels I purchased on close-out: Atom One X-Flex wheels in 87a. I planned on saving these wheels to use as my racing wheels for the 2012 racing series. 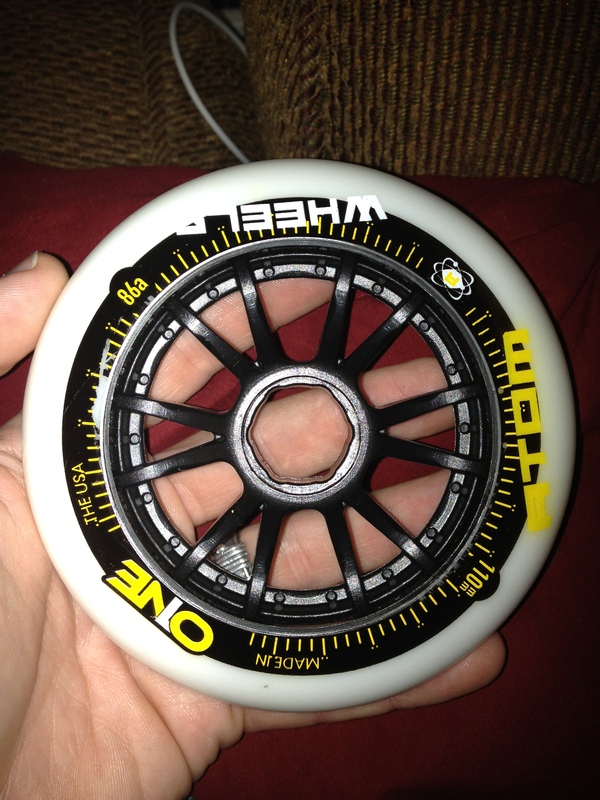 However, I got in on the Bont Black Ops wheel deal when I signed up for NROC. As a result, I pitched the Bong G3 wheels, and moved the Atom One wheels into the position of my everyday wheels. I have used them with my Bionic Swiss bearings, also from Luigino, and my older ILQ9 Classic bearings. The wheels are consistent regardless of which bearing is used. 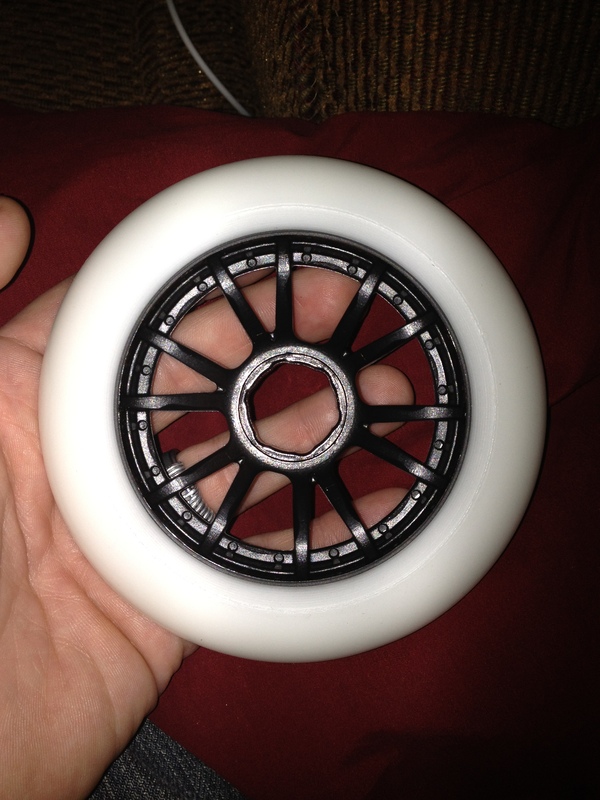 Out of the package, these are great looking wheels. The X-Flex hub means the hubs are different than the regular Atom Reflex hub. The pictures that follow are good examples. The black hub wheels are the Atom One X-Flex wheels, the white hub wheels are Atom One IQ Reflex wheels (I have a couple spares in case I need them). You can see the difference in the hubs on these wheels. 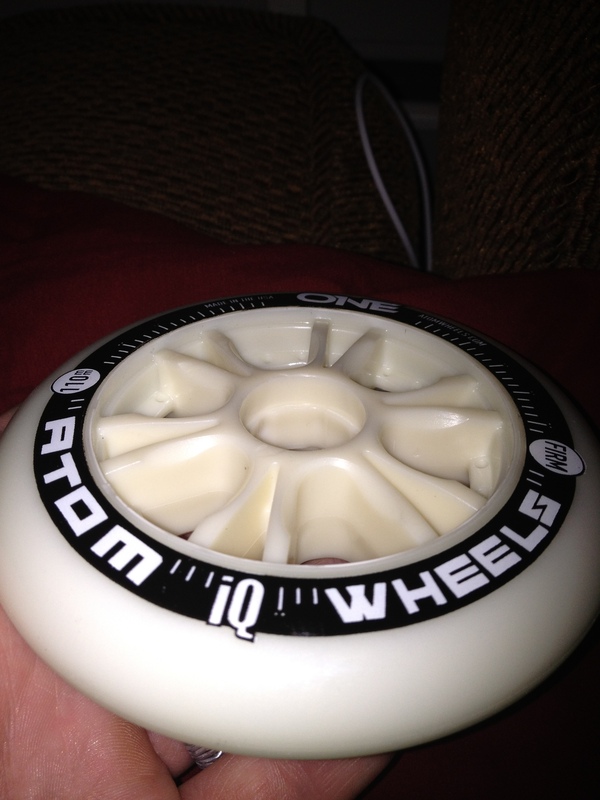 The Reflex core has become the staple of the Atom IQ wheels. Apparently, the IQ flex band mixed with the x-flex core makes the feel too soft, even at a higher durometer. I wouldn’t have thought this was an issue, and I didn’t notice this as a problem with my X-Flex IQ wheels. However, at that time, I wasn’t pushing hard enough to be able to feel the difference. Now, though, I think I am in a position where I push harder, with better form, and can feel more of how the wheels react in different situations. Generally, these wheels are hard. At 87a, that is to be expected. You can feel the hardness from the durometer on rougher roads. They don’t feel as hard as the Bont G3 wheels, which is odd because those wheels are 84a durometer. The hub is what plays a part here. The rebound isn’t very strong on these wheels, again, I think, due to the hardness, but the hubs make the difference. The slimmer X-Flex hubs really flex well, and make the harder wheel more responsive than would be expected with a stiffer hub. As a result, the hardness of the wheel and the flex in the hub make them a solid wheel for smoother conditions. This is a great place to start on a wheel. Another big benefit from these wheels is the roll. They roll as well as the IQ X-Flex version. This is great for keeping momentum while skating. You don’t feel like you have to fight the gear for speed. When you are skating with great form, increased roll helps the skates work for your push, so that you can save energy in a long race. These wheels do very well with roll. However, they don’t roll as well in rougher conditions. In fact, the wheels start to feel dead in rougher road conditions. I think this is due to a lack of rebound. Generally, I haven’t really thought about the benefit of rebound. Softer urethane has good rebound in theory, while harder urethane shouldn’t rebound as well. However, the Bont G3 wheels have terrible rebound, partly due to a hard hub. This is odd since they are softer wheels than the Atom One wheels that are the subject of this review. The urethane in these wheels feels true to form, in that it lacks rebound. This probably helps with roll, but makes the wheels feel dead on a rough surface. The flex in the hub, while providing great snap, doesn’t totally compensate for the lack of rebound in the wheels. Grip is the other concern with these wheels. They seem to grip well on their normal profile, especially after the exterior coating comes off. However, I find they slip at the end of the push, particularly in a deep squat at speed. They also have a hard time holding very tight corners at speed. To a degree, this is to be expected with a wheel this hard. They do grip better than the Bont G3 wheel for the most part, but the slip at the end of the push sacrifices power and speed. A lot of the slipping may be driven by the surface, though. It seems to occur in different situations more often, like on rougher surfaces, or older tarmac. Similarly, if my weight is too far forward, I find the rear wheels snake a bit in the push. Otherwise, the grip is consistent on most surfaces, and hasn’t given me reason to be concerned. The wear on these wheels are terrific. I have at least 200 miles on these wheels, and they haven’t lost much more than millimeter of surface. They don’t need to be rotated very often, which means more skating and less up-keep, which is great for the fun of the sport because it means more time skating. Bottom Line: These are great wheels if you like harder wheels. They are acceptable on rougher surfaces, but this is the only serious draw back to these wheels. As a training wheel, these are perfect for most road conditions. They roll very well wear very well. If you can find these wheels on a close-out, pick up a set. I am going to keep my eye out for more in the future. However, these are an older technology wheel. Atom has released the Matrix line, which is the updated road wheel from Atom. The regular Matrix is, from what I understand, very similar to this wheel. The Matrix IQ is an updated Atom One IQ that is supposed to have new technology in the flex band. Atom is no longer incorporating the X-Flex hub into the IQ wheels. If you want to stay competitive, you need a banded wheel. However, these are great wheels for general skating and racing on a budget. I am headed to London for the London Inline Marathon on May 20. My wife and I are taking our vacation in London this year, and it just happens to coincide with the Marathon. I skated with most of my race gear last Sunday, so I think I am ready to go. I am hopeful that I will be able to skate a couple of times while we are there prior to the race, otherwise, all the walking should keep me in shape. I went out for a Team Rainbo practice last weekend, and though it was wet, had a great practice. The Atom One x-flex wheels really make all the difference in the world, but more on that in a later post as I will have a full review of the Atom One x-flex and Bont Black Ops wheels coming soon. I also have been having some trouble with my video converters. WinX HD Video Converter has been giving me some problems, so I am using my back up software, Any Video Converter. I haven’t used it yet to process video from my camera, but I am still messing with the settings. I will update the tutorial on overlay videos if necessary. I recently took some video of one of my other training routes. It was a tough skate on the way back. The first half was great because I had a 20+ mph wind at my back. When I turned around and headed back towards home, everything changed. You can hear it in the video. Be warned that it gets loud. The video follows. This was one of my last skates on my Bont G3 wheels. I am happy to see those wheels go. I will hopefully have race video and pictures when I get back from vacation.